AMMAN - HE Dr. Talal Abu-Ghazaleh announced the grant of full scholarships for MBA students at Talal Abu-Ghazaleh University College for Innovation (TAGUCI) for refugees at Syrian and Palestinian camps in Jordan and Lebanon, and 50% scholarships for students who meet MBA requirements in Jordan and the Arab countries. The scholarships are a part of the Corporate Social Responsibility guided by Dr. Abu-Ghazaleh for the service of the community and youth capacity development through Talal Abu-Ghazaleh Foundation (TAG-Foundation). Dr. Abu-Ghazaleh stressed the significance of the scholarships in supporting youth, particularly refugees, to overcome financial obstacles by granting them the opportunity to access high-level education and knowledge, pointing out that education is their only means towards improving their conditions and developing their skills. Talal Abu-Ghazaleh Foundation was established as a non-profit company by Talal Abu-Ghazaleh Organization (TAG-Org) to promote sustainable development with a focus on social and economic development initiatives to enhance the capabilities of individuals, groups, institutions and associations around the world. 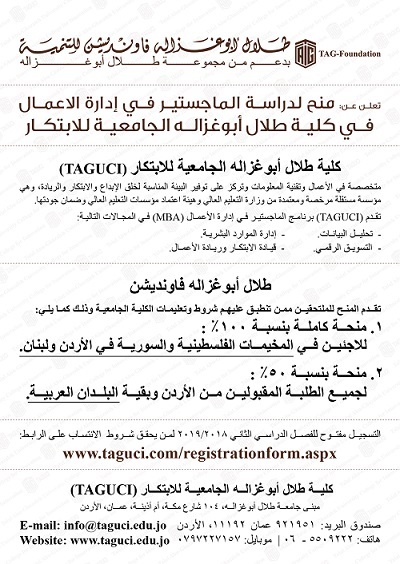 Dr. Abu-Ghazaleh stated that TAGUCI, a University College specializing in business and information technology with the aim to provide the appropriate environment for creativity and innovation, is accredited by the Ministry of Higher Education and the Higher Education Accreditation Commission (HEAC). It is noteworthy to mention that TAGUCI has recently announced that it started receiving applications for the second semester of the academic year 2018/2019 for MBA program tracks including Innovative Leadership, Entrepreneurship, Human Resources Management, Digital Marketing and Data Analytics.